Students Representative Council, 1927, Hardback. Condition: Good+. Gently bruised at the head, tail and corners of the binding with several small puncture marks to the upper board. Tanning to the pastedowns and blanks. Text complete, clean and tight. 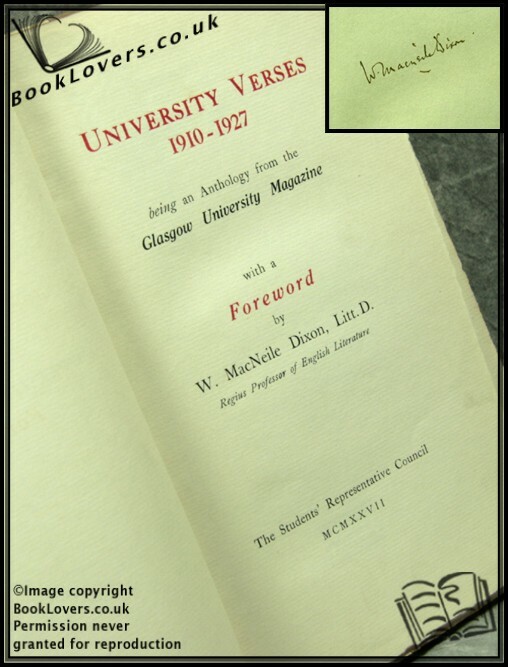 An anthology from the Glasgow University Magazine. Number 85 of a limited edition of 100 copies. Signed by the author on the first blank and hand-numbered. Size: 9¼" x 6". Brown boards with Gilt titling to the Spine & Upper Board. 151 pages.